I was SO hoping to be able to use this picture for something when I took it. 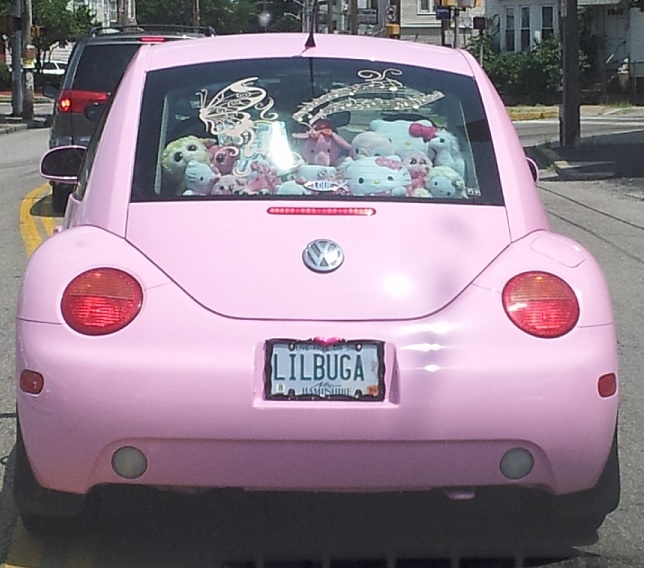 I was coming off I-95 in Providence and this little pink bug was in front of me. As I got closer I could see better what was in the window. Clearly, she is a Hello Kitty fan…a BIG one! You’d have to be to use your car as a container for carting your collection around town. How do I know it was a she driving the car; well when I sidled up on the passenger side I looked in the window and could see a girl in the driver’s seat with a phone in one and flipping her hair with the other. Regardless, she’s the recipient of today’s thank you–I couldn’t be happier to have a fun picture for the Weekly Photo Challenge!